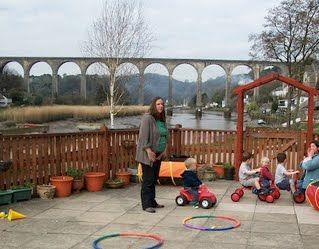 Tamar Valley Pre-School meets in Calstock Village Hall, a lovely bright hall with outside play area, complete with stunning views towards woodland and the viaduct. We would love to welcome you to our special and friendly group. Our vision is to provide a safe and stimulating environment where all children are valued as individuals and can gain a sense of self worth, achieve their full potential and can be happy and healthy and learn through play. We celebrate and value different cultures and encourage and appreciate moral values. We have Local Education Authority funded places for 3 year old's and are registered and inspected by Ofsted. We meet on a Monday, Wednesday & Friday in term time. On Thursday's we take our over 3's to spend a morning at Calstock Primary School.